Desiring Something Greater: What Did I Do? : Red Shoes! What Did I Do? : Red Shoes! I had an interesting week, although I kept my New Year's resolution a little more low-key. It will likely be that way for the next while, since I have a lot going on right now and it may be hard to get really adventurous in the midst of the busyness. But I will try to be creative where I can. April 2: Has anyone else ever wondered what Throwback Thursday is all about, or was I the only one who hadn't exactly figured it out yet? I had a bit of an idea because the pictures I often saw on Facebook, but I now understand this social media trend a little more. I found out that "Throwback Thursday is the name of a weekly social media posting trend and hashtag game that users participate in to share and look back fondly on some of their favorite memories--hence the "throwback" theme. In this case, the "throwback" component of a post can pertain to basically anything that happened in the past." (webtrends.about.com) I thought about trying this, but that would mean digging out pictures from the 90s or something. Cute, but naw. At least not now anyway. Thanks to Anne of Green Gables, I learnt that elocution is "the art of clear and expressive speech, esp. of distinct pronunciation and articulation" or "a particular style of speech." And I learned that "kerwollops" is not a word. While first at Queen's, Josie Pye talks about a French professor giving her the "kerwollops of the heart." An online search led me to believe the author made up the word, since I couldn't find it defined in any dictionary, and anything I found referenced to this instance in the book. But I think the context gives me a pretty good idea of what she meant. April 3: Good Friday was a good day, but I was a slacker. While having lunch, I look out across neighbouring yards to see turkeys and other fowl come through the neighbourhood. It really was a sight to behold! There were a number of white birds and I was trying to figure out what they were. Ducks, geese, swans? One was bigger than the rest, and my mom suggested it was a turkey as well. "There's such a thing as white turkeys?! I didn't know that!" Clearly, I do not know my birds. Indeed, turkeys do come in white, as well as dark colours. It reminded me of Staten Island days when I would be driving down the road closer to the beach and would have to stop and wait for the turkeys to cross the road. And listening to them gobble is so hilarious! It often takes only little things to make my day! April 4: This past weekend, we had another hockey tournament at work, and these are usually accompanied by various vendors selling clothing, pictures, hockey memorabilia, knick-knacks and other items. There was one such vendor set up across from the concession, tables arrayed with lots and lots of leggings, in some very bright and bold styles! But there were certainly none like the leggings being sported by the half manikin standing behind him. And I got one of my CRAZY ideas! I mentioned it to my co-workers, who I fill in on some of the things I've been doing. At a quiet moment, I made my way casually to the table, explained my intent, got a pair of said leggings, and made my way for the bathroom. I would not come out of the bathroom wearing them, nor will I make my photo public. All I will say is that they were black, white, purple, fluorescent orange, lime green and bright yellow. Not only that, but these were the colours that made up a collage of various animal print patterns in diagonal stripes from top to bottom. I don't know how else to describe it. They were intense! This was my first time trying on them tight leggings that are so popular now. April 5: This Easter Sunday, I got myself out of bed way early to attend my first Easter sunrise service on the beach with my church. April 6: Again, thanks to Anne Shirley, I now know what a chaplet is. Sort of. I think. There are a few definitions for the word "chaplet." It can be "a wreath or garland for the head" or a string of beads, similar to a rosary, used for prayers, among a few other definitions. I think Anne was likely referring to a wreath, especially since she isn't Catholic. 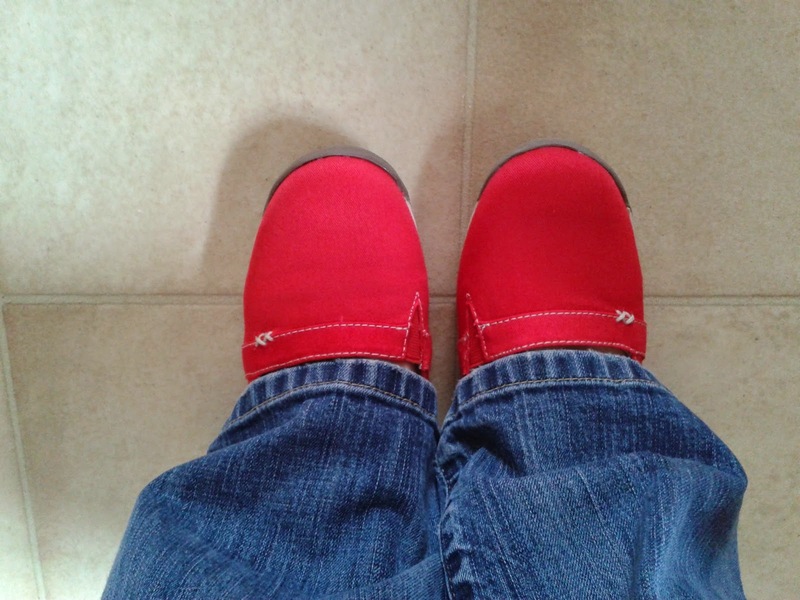 April 7: Sometimes you just need a pair of red shoes! I'm not usually this bold, and although I liked the black ones, my first reaction to the red was "Ugh! No!" But I tried them on and went "Heeeeyy!" and thought of the numerous possibilities. So I bought them. I could have fun experimenting with these. I also tried a plain cappuccino at work. I liked that it wasn't as sweet as flavoured ones, but I do like other ones more I think. When I read the word "hellion", it didn't sound very good. And "alcove"? Well, that reminded me of "cove" and this wasn't talking about any water body or anything. So I figured it out today. A hellion is "a disorderly, troublesome, rowdy, or mischievous person." Hellions are also fictional characters in the Marvel comics. And "alcove" just referred to the space they were living in. This book has been a blessing to me and continues to be to me. If you're interested, I would definitely recommend it. Labels: books, fashion, quotes, What Did I Do?